Cocktails today, in expert hands, are an art form. The thoughtful, deliberate balance of disparate flavours is meant not only to intoxicate, but to express refinement, even elegance. Mixed drinks didn’t always evoke these things, however; one eighteenth-century concoction, the “King Calli,” is a case in point. Beer Street. design’d by W. Hogarth, 1751. Credit: Wellcome Library, London. The King Calli was a type of flip–a mixture of beer, sugar, spirits, and eggs, which was warmed up by stirring it with a red-hot fire-poker. The heat caramelized the sugars, slightly cooked the egg, and caused the drink to froth up (or ‘flip’) like a milkshake. The addition of the egg is perhaps more foreign to us than the idea of stirring a cocktail with a fire-poker. Even cooked, the egg seems an unpleasant adulteration. Eggs are for “morning after” cures. They’re punishment for over-indulgence, summoning the spectre of salmonella poisoning to the bar. 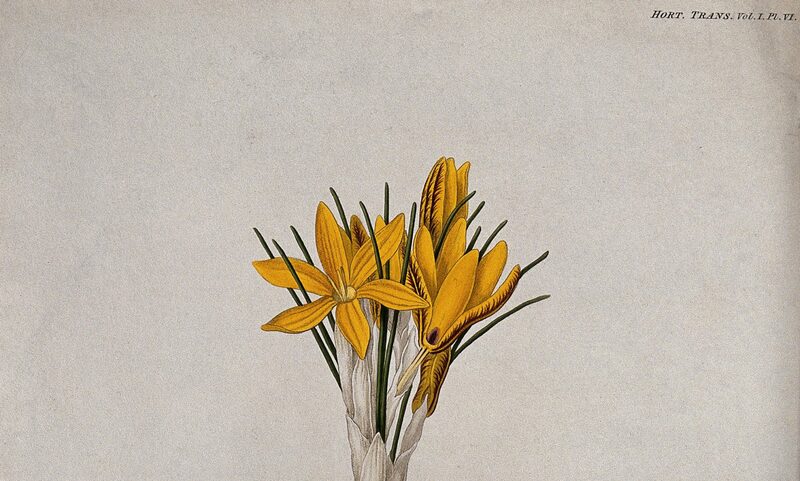 The other elements of the King Calli, however, as first described by English naturalist Joseph Banks after his famed 1766 tour of Newfoundland, are less daunting. They begin with another, simpler cocktail, known as Calibogus—a generous shot of rum or brandy (in a pinch, the drinker might use gin) poured into a pint of spruce beer. This mixture, sweetened with molasses and enriched with egg, Banks called an “Egg Calli.” Heating it elevated the drink to its kingly rank. Banks’s description of Calibogus/King Calli is frequently repeated in twentieth-century sources, often unattributed. The casual reader might assume, as a result, that Calibogus and its derivatives were as common in eighteenth-century America as rum punch was in London. This may be true (flips were very popular), but I’ve yet to find evidence that this version of the flip was particularly common. What was remarkably common was spruce beer. Charles Clerke, sailing with James Cook, called the brew a “very palatable pleasant drink,” so much so that “the Major part of the People … drink pretty plentifully of it.” North American newspapers were also replete with spruce beer advertisements and ads for spruce essence, an inspissated liquid that minimized the labour of home-brewing. 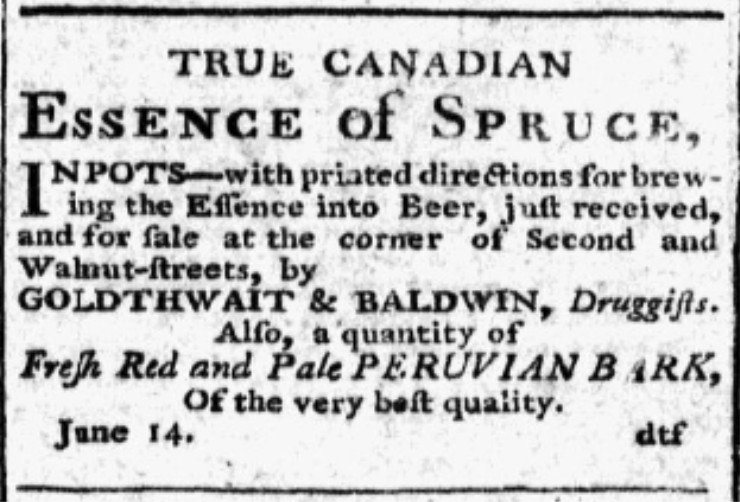 Recipes for home-brewed spruce beer were regularly reprinted in newspapers, and it made a conspicuous appearance in Amelia Simmons’ 1796 American Cookery, likely the first cookbook published by, and about, American food and drink. Advertisement from The Federal Gazette and Philadelphia Daily Advertiser, 27 June 1798, p. 1. Spruce beer smells and tastes like Christmas. If mixed into a Calibogus with a bit of rum, it inspires memories of my Grandmother’s (very potent) holiday rum balls. However, underlining the ways that smell and taste are rooted in changeable historical context, eighteenth-century spruce beer was not associated with Christmas. At its peak of popularity, in fact, it was a warm-weather beverage, especially prized in springtime. It was also promoted as a health drink, rather than a source of pleasurable holiday intoxication. It’s impossible to say who first decided to ferment the infusion, but beer made from spruce and molasses, linked to Cartier’s “discovery,” quickly became associated with a number of health benefits besides the cure of scurvy. Cartier noted that several of his men “troubled by the French Pockes” were cured by the unfermented tisane, and the fermented version was variously claimed to purify the blood, calm the stomach, improve work-ethic and personal appearance, prevent the necessity for drinking unwholesome water, and — according to the City Gazette of Charleston, South Carolina (via “a late London Paper” on December 30, 1796) to cure and prevent Yellow Fever. 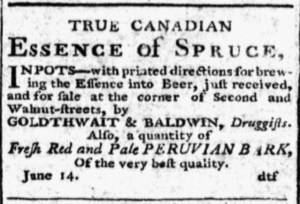 Tightening this link between spruce beer and health, the essence was commonly sold by apothecaries and druggists, appearing in advertisements for patent medicines and Pervian Bark—the best quality versions apparently derived from Canadian trees. There is, alas, no medicinal quality to spruce beer — nor to any other sort of alcohol. Arguably, the King Calli, via that incongruous egg, might be healthiest version of the piney brew. But there was clearly pleasure in its consumption. 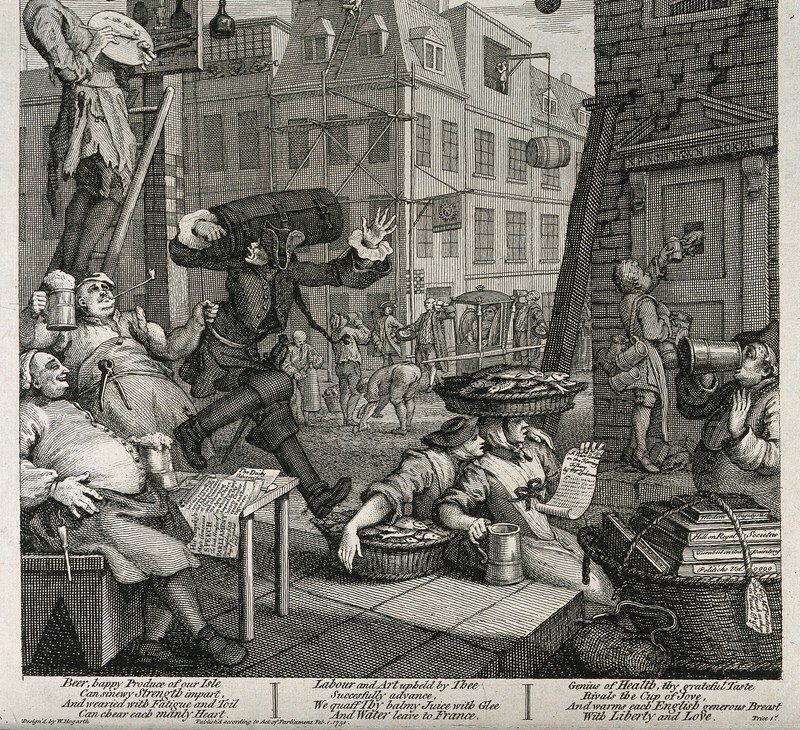 The flavour, the scent, the communal ritual of drinking, speaks not to people who drank to prevent scurvy or cure the “pockes”, but to people who enjoyed the physical effects of a tipple. Spruce beer also reminds us of the ways that European colonizers manufactured the comforts of home from the raw materials of foreign environments. 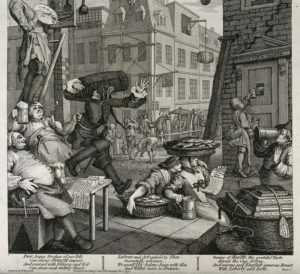 A yet, in doing so, they reveal a dependence on emerging global trade networks: spruce beer demanded molasses, Calibogus required rum: this quintessentially “American” drink demanded ingredients from around the world — ingredients which, in turn, Europeans considered essential to their goal of global “discovery” and colonization. Joseph Banks in Newfoundland and Labrador, 1766: His Diary, Manuscripts and Collections, edited by A.M. Lysaght (Berkeley and Los Angeles: University of California Press, 1971), 139-140.